The national flag of India is made up of three evenly-sized horizontal bands of color: saffron, white, and green, with a 24 spoke dark blue wheel in the center. The flag was adopted on July 22nd, 1947, becoming the official flag of the Dominion of India on August 15th, 1947 and later retained by the Republic of India. The flag is traditionally constructed from a hand spun cloth or silk material, with the process for manufacture set by the Bureau of Indian Standards. The Khadi Development and Village Industries Commission allocates official manufacturing rights to regional groups. 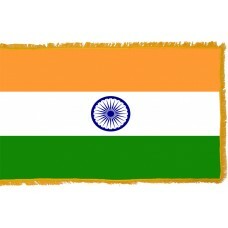 There is a flag code of India governing the use of the flag and that of any national emblems. In 1921, Ghandi first suggested a flag to the Indian National Congress. The traditional spinning wheel adorned the center of the flag to symbolize Ghandi's aim to make Indians self-sufficient by creating their own clothes. Modifications followed, for religious communities the white stripe became an addition. The three colors of saffron, white, and green symbolize courage and sacrifice, peace and truth, and faith and chivalry, avoiding any sectarian association. Many different designs were used by leaders of the different independent states, before the Indian Independence Movement. After the rebellion of 1857, resulting in direct Imperial rule over the establishment, the British rulers of India came up with the concept of a single flag. The first flag was similar to other flags of British colonies such as Canada and Australia. This flag comprised of a blue background, a Union flag in the upper left side, and the star of India and crown to the middle right side. A new flag was introduced in 1905 following the partition of Bengal to represent the Indian Independence Movement. The movement sought to unite different sectors within the country and used religious symbols in the green, yellow, and red tricolor flag. Eight white lotuses were placed on the upper green band for the eight provinces, the Vande Mataram slogan in Hindi on the middle yellow band with the sun and crescent being located on the bottom red band. A slightly modified version of this flag was used at the second International Socialist Congress meeting in Stuttgart in 1907. Sister Nivedita, a Hindu reformist also submitted a different flag design which included a thunderbolt in the center and one hundred and eight oil lamps for the border. The flag was used at the meeting of the Indian National Congress in 1906. A booklet showing thirty new flag designs from Pingali Venkayya, funded by members from the high court of Madras was submitted in 1916, helping to keep the flag movement alive. In the early 1920’s flag discussions were held across British dominions and as a result the British Indian government put more importance on having a National flag of India as a symbol. On the final version of the Flag, the symbol in the center was changed from a spinning wheel to a Chakra wheel from the Lion Capital of Ashoka in 1947.